Is a Chipper Club a legal club? I have never seen it used by the pros. 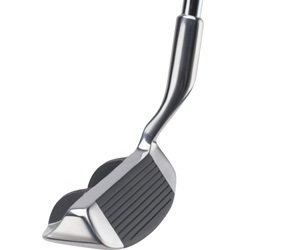 It is a legal club considering it does not have a putter grip and must be treated as an iron. Here is the link where the USGA answers it in its Club and Ball FAQ. Therefore, the chipper must conform to all the guidelines laid out in Appendix II Rules 1-5. As for the pros using the chipper I had to do a little bit of research and have concluded that it has never been a popular club among the pros. The reason why the club is not used on tour is because it was designed for the amateur or beginner because of its ease of use. Today you will see many tour pros using either a hybrid or 6 or 7 iron when they chip so they can utilize all 14 clubs in their bags. Join in and write your own page! It's easy to do. How? Simply click here to return to Bo Knows Golf Tips Questions and Answers. I promise to use it only to send you Bo Knows Golf Tips Newsletter. Can't find what you're looking for? 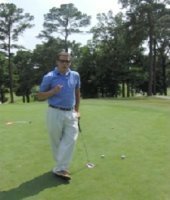 Ask me over at Golf Questions and Answers Page. 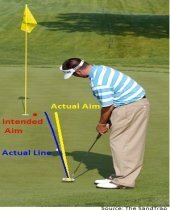 Find out why a correctly fit putter is crucial to the success of your Putting Line. Bo, I wanted to thank you for your help so far with my golf game. I wanted to let you know that I shot a 75 the other day in a tournament round, my best round ever. I had 32 total putts and NO 3 putts. I definitely couldn't have done that before. Thanks again and I'll be back in touch soon to get some more lessons lined up. Bo I just wanted to tell you about another tournament I played in. I went out and played and shot a 75 which is one of my best rounds this year so I think everything is coming together. I've been making alot of birdies lately and just wanted to thank you for everything! Hey Bo when I got back from camp I played really well I’m putting great and I’m hitting the ball well. Thank you for everything at camp. Hey Bo!!! I have been playing my best in golf, mostly because of you!!! two days ago I shot an 80 in my club tourney and came in 3rd place. I played in a tournament when I got back from camp and shot 76 and came in fourth. I feel much more confident on the course with my mental thoughts. I used the tips you wrote down on that sheet and they have helped me alot.